RECORDS CUSTOM CABINETS AND TRIM CARPENTRY OF WICHITA, KANSAS IS YOUR BEST SOURCE FOR BEAUTIFUL, HEIRLOOM QUALITY KITCHEN CABINETS, EXCEPTIONAL STAIRCASES, ELEGANT ENTERTAINMENT CENTERS AND ONE-OF-A-KIND ARCHITECTURAL ELEMENTS THAT ARE SURE TO STUN, AMAZE AND IMPRESS FOR YEARS TO COME! At Records Custom Cabinets and Trim, we provide exceptional cabinetry and trim work services to Central Kansas’ most discerning new home builders, home owners and businesses. Our beautiful custom cabinetry work can be found in many of Wichita’s finest neighborhoods including: The Hawthorne, Wilson Estates, Flint Hills National, Rocky Creek, Reeds Cove, Reflection Ridge, Oak Creek, Lakepoint, Fox Ridge, Auburn Hills, Foliage, Whitetail, the Waterfront and many more. Our custom commercial cabinetry and trim work can be found in the area’s finest hotels, clinics, churches, banks, malls, zoos and restaurants. We are an established, trusted local cabinet company with our roots in the Wichita area. Quality, integrity, honesty and value are more than just words at Records Cabinets and Trim Carpentry. We work hard to insure that our work is completed on schedule and on budget, while maintaining a standard of quality that is head and shoulders above the competition. 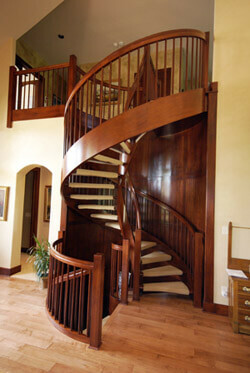 Regardless of the size of the project, our craftsmen strive for perfection in everything we do. Our goal is to build the finest cabinetry and trim carpentry anywhere and deliver our customers quality, style, distinction, innovation and value that far exceed their expectations while being mindful of the environment and utilizing greener construction materials and processes wherever possible. 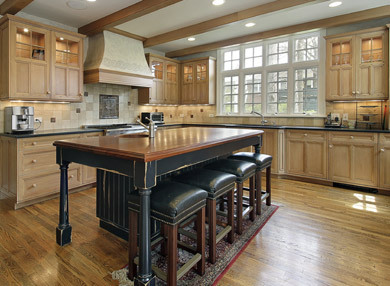 While we’re best known for our custom built cabinets and trim carpentry in new homes, we also offer complete kitchen and bath design and remodeling services. Whether you are building a new custom home or remodeling your existing one, Records Custom Cabinets and Trim Carpentry can design your new kitchen or bathroom using the latest in computerized 3D home design software to render beautiful photo-realistic images of your new space! Our advanced software gives us the ability to show you multiple customized kitchen and bath designs with varying door and cabinet styles, a wide variety of wood species, and even depict your appliance, countertop, and backsplash tile choices in stunning life-like beauty! Every design detail can be meticulously selected and rendered—wall color, floor material, even light fixtures and faucets can be placed and easily moved around for the perfect kitchen or bathroom layout! Whether you are needing a custom built vanity or a complete kitchen remodel, we’d love to show you what we can do with your space! If you’re building a new home or business or considering remodeling your existing home or office, please call (316)733-6800 or contact us online for a free, no pressure, no obligation consultation. Check out our blog for additional inspiration, insight and tips!